Now that I am a mom I have experienced "the other side" of a few things. I have been a Pediatric Nurse since 2003, but since becoming a mom I have experienced being on the other side of the exam table. The one where the patient is clinging to me and where the child with the fever is my child. I worked out in the village school here in Haiti for 3 years working with school kids on hygiene and check-ups and other school nurse activities. Now I am sending my child to school. 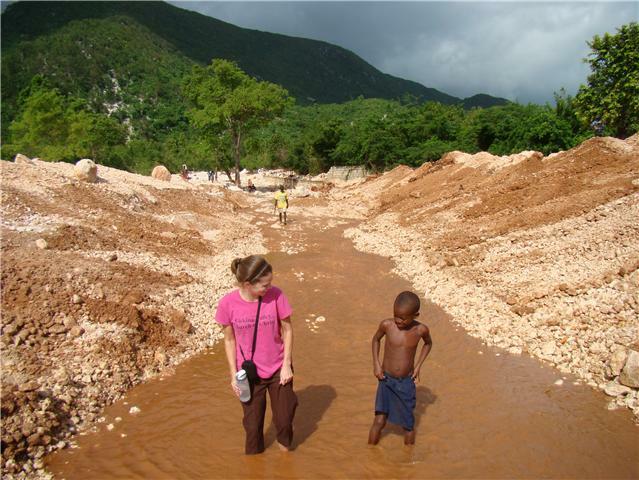 Odessa goes to Haitian preschool everyday for 5 1/2 hours. I am on the other side of the school gate now. I am leaving my child with strangers for the better part of her day. Odessa absolutely loves school and the rare occasion when i ask her if she wants to stay home with mommy or go to school, she always picks school. Her school is in French so my kid is learning to speak a language I don't speak (teenage years should be a blast!) and they have rules that seem really weird to this American mom...but then again we're not in America. If it is raining in the morning, school is canceled that day. Now we have all heard of snow days but rain days??? In their defense when it rains here it is like a monsoon. But still... So I had to ask, "If it is raining when school lets out, you are going to hold the kids here until it stops?" Strike one for the only white mom in the school. Don't pack greasy foods for snack time because it gets the kid's clothes dirty. When there is rioting on the streets during the school day, please come pick up your child as the staff is going home. Seriously that's what they said. I had to laugh at the "when there is rioting" not "if there is rioting". We will send outlines home of what your child will be learning in French each week. Please go over this each evening with your child. Riiiiight. My discussion with Odessa goes something like this, "Odessa this week you are learning some important stuff in French. Mommy wants to to pay real close attention in school to find out what it is. Then when you bring your pictures and projects home, mommy will have some sort of idea what the heck THIS paper says." I am so glad Odessa loves this school and it is small enough to where all the teachers know all the students. She even wants to wear her uniform Saturdays and Sundays. 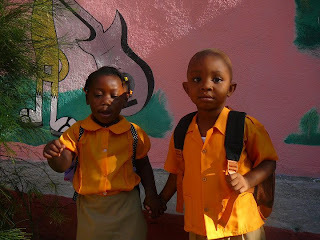 She is in class with her buddy "GeeGee" who is David's nephew. They cause all kinds of problems together at home and at school. School is a privilege in Haiti. Every morning on our walk to school we pass kids who don't get to go to school on the street. May God provide me with the wisdom to teach my child how blessed she is and how to have compassion for those who have less. And for us not to start seeing these sights as common everyday things and become complacent. I love reading this post, especially the sweet picture of Odessa. I was a teacher for 6 years, and had all these ideas about parents, and now that I'm on the other side, I understand a little more why they do the things they do.